There are six main versions of Vampire. Four for Masquerade (1st, 2nd, Revised, and 20th Anniversary) and three for Dark Ages (Vampire:Dark Ages, Dark Ages: Vampire, and Dark Ages 20th Anniversary), with an official 5th on its way. There’s not a huge difference between the editions (though I talk about some of them here), and I tend to mix them all together. All in all, any such differences are slight, and more a matter of preference. This is third and final part of my Solo play through of the Vampire module Clash of Wills. The Introduction and Characters can be found here. Here are parts one and two. The characters awaken, each alone and in darkness. Godfrey casually walks downstairs at the inn, wondering if any others have been around. The innkeeper tearfully tells him the news of what has been happening, and how the entire town is in mourning. Godfrey attempts to convey shock and horror at the events (Manipulation + Acting, Difficulty 6 since he is honestly shocked about the Assessors) and with 4 successes the innkeeper suspects nothing of the noble stranger. Does he wait for the other characters? 50/50: 31—Yes. He’s not sure where the others are, but he knows Johann likes to sleep on his own. This is second part of my Solo play through of the Vampire module Clash of Wills. The Introduction and Characters can be found here. Part one is here. Dawn is coming soon, and the vampires must seek shelter from the sun harmful light. Where do they seek shelter? 1) Rooms in the Keep, 2) In the catacombs beneath, 3) in the inn, 4) at Jills, 5) burying themselves in the ground. 3. The travel to the inn at Redford, the Maiden of the Mist, and take their rooms. Samuel is to remain awake and let Johann know where they are. Johann has been gone for a while, and I’m not sure if anything has happened while he was away. Has anything happened with Johann? Chaos Roll 5—yes. This is first part of my Solo play through of the Vampire module Clash of Wills. The Introduction and Characters can be found here. Godfrey, Johann, and Samuel are summoned by Nicolas, the true servant of his Dark Majesty Joseph, to secure the inheritance of the County of Galtre to Richard I the King. Godfrey eagerly and proudly accepts the charge, and the other two have no say in the matter whatsoever. Nicolas gives them a complete will for the Earl to sign and a Letter of Introduction, signed by a powerful mortal Duke who is known to be a confident of the King. In addition, the receive fine horses, armor, and weapons, and permission to feed freely and fully before their journey begins. 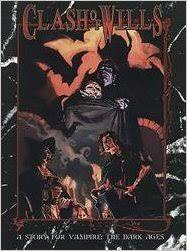 For the first story in "The Great World of Darkness Chronicle" I will be playing Clash of Wills. Spoilers, naturally, follow. The story in question involves a group of British vampires dispatched by Mithras, the Prince of London to the small County of Galtre. It's monstrous and aged Earl is dying, and planning to will his lands to the church. As the British church is controlled by Mithras' rivals, he desires the lands to pass to the Crown. The players have been dispatched to see that Mithras' will is enacted. First of all, I will be making a few changes to the established setting. I want to incorporate as much of my ideas on how to redo the Long Night as possible given the module-focused nature of this campaign. To summarize quickly, the Dark Ages are a time of confinement, isolation, and ignorance. Even the story of Caine and his relationship to vampires is little known in most of the continent. Instead, various Elders rules their progeny with an iron fist. Even the term "Prince" is an anachronism for this time period. And much of the power of the Elders comes from fantastic and self-aggrandizing myths they tell about themselves, and to which the childer have no reason to even question. "A plan is just a list of things that don't happen." Before I begin this mammoth undertaking, I want to spend a few moments collecting my thoughts and figuring out exactly how I intend to do the "Great World of Darkness Chronicle." It's easy to get lost with something like this, and having some rough guidelines will hopefully help keep things clear for everyone. Obviously, these are just my current thoughts, and they will naturally evolve as I get a better grasp of what it is that I hope to accomplish with the Chronicle. If I start straying too far from this, I'll stop to make clear what I'm changing and why. So, in no particular order, here's where I'm currently at.